Imperial Cat‘s Step ‘n Play Pet Steps is one of the best cat items that catched Cat Channel’s editors in a glance! Step ‘n Play Pet Steps are a lightweight, affordable, and eco-friendly alternative to expensive, bulky pet steps currently on the market. They are purrfectly made and designed for your cats/kitties and are also great if you own small dogs too! Step ‘n Play Pet Steps are easy to assemble, have an ultra lightweight and are portable. They’ll surely provide fun playtime and exercise for your beloved cats as you do other household works. These pet steps are comprised of sturdy, 100% recyclable cardboard that can support a cat up to 25 pounds! Isn’t that great? So cat parents out there, what are you waiting for? 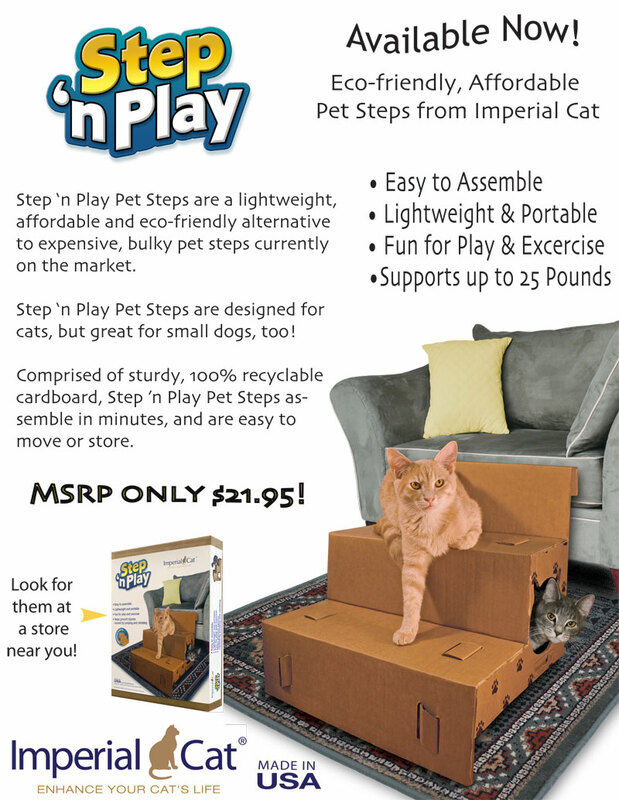 Grab one of Imperial Cat’s Step ‘n Play Pet Steps with an MSRP of only $21.95! Made in USA. Browse Floppy Cats Website and Floppy Cats Blog Site for more product reviews and exciting offers! Next Next post: NEW! Kritter Pink Kondo Deluxe – Order Now and Receive FREE SHIPPING!